This project was inspired by an impulse, initiated back in 2003, to record vignettes of life with Alan Chadwick by some of his former students. Two of those students, Peter Jorris and Greg Haynes, began to write up first-hand accounts of experiences involving Alan so that others, who never had an opportunity to work with this remarkable man, could form some idea of who he was and what he stood for. Because so much misinformation exists on the subject, it was also our intention to set the record straight, as far as possible, from the limited perspective of our own experience. It was hoped that others might eventually join the effort, and so round out the picture. In the succeeding years, Greg began to create audio recordings describing some of his experiences in Alan's gardens. In time, other former students and friends of Alan Chadwick began to participate. The collective results of their labors are presented here, with the intention of sharing such personal, first-hand experiences with a wider audience. Alan Chadwick was one of those rare individuals whom one may meet, perhaps, once in a lifetime. His deep knowledge of horticulture was rooted in the experiences of generations of professional organic gardeners in the European tradition. He was an accomplished painter, a musician, a Shakespearean actor, and therefore his consummate skills as an artist made his gardens works of art in themselves. They were embodiments of beauty so powerful as to shake the world view of those who entered into them. You had to reorient your thinking to account for the irrefutable observation that nature could respond so abundantly to the hand of a gardener who approached her with the right attitude: with reverence, with a willingness to work within her laws, with a respect for all of life. Alan's wisdom was so profound that, in our opinion, all those remnants of his life and outlook that can be remembered deserve to be shared. This is our primary purpose for creating this website. But there are also some side issues to address: Alan's attitude toward nature was in sharp conflict with the prevailing view of materialistic science that nothing exists that cannot be physically measured. 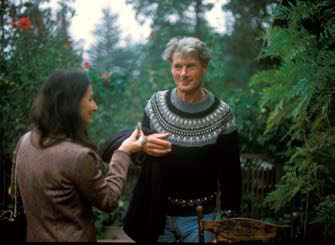 At the University of California at Santa Cruz, where Alan created his first student-oriented garden in the United States, some professors of the conventional reductionist mode of thought began to lodge complaints against him, claiming that he was leading students down false paths. Alan had described subtle, intangible forces that had to be reckoned with if one were to unleash the cornucopia of nature as he had so clearly done, and growing numbers of students began to take him seriously. The living, personal example he provided was that of a man eminently in tune with the natural world. He lived his life in a most creative manner, so full of humor, philosophy, art, exquisite fresh foods harvested directly from the garden, poetry, mythology, and all delivered in such consummate theatrical style. By way of contrast, the sometimes dull, overly intellectual university professors seemed much too abstract and disconnected. This caused a fair amount of friction within certain of the science departments of the university. One UCSC biochemist, Kenneth Thimann, led a campaign against what Alan Chadwick was accomplishing at the Student Garden Project. Thimann had done res earch that led to the discovery and production of herbicides and defoliants, and eventually to the development of "Agent Orange," a defoliant used extensively on the forests of Southeast Asia during the Vietnam War, and which caused incurable problems in the nervous systems of people who were exposed to it. Despite notable hazards and adverse ecological effects, the study of biochemistry and its advancement of synthetic agriculture was nevertheless a mainstay in the scientific curriculum at the university, a fact which certain professors felt needed reinforcing. This was Thimann’s sense of what students should be studying, not absorbing dubious old-fashioned ideas about respecting the earth from an un-credentialed upstart like Alan Chadwick. Eventually the university fired Alan. They capitalized on his idealism for five years and then all but cast him aside, leaving him with nothing to show for his incredibly hard work and brilliant success at converting a barren hillside into a nationally recognized showplace. The people involved at that time had various ostensible justifications for their mistreatment of Alan and subsequently have, over the years, promoted an overtly distorted view of Alan Chadwick’s character and vision. He has been unfairly portrayed as an eccentric crank with an impossible temper, a fanatic who hated people, and as a person who denied science. Such a misleading portrayal has somewhat obscured the light that Alan brought into the world. We hope to balance that picture by describing our own experiences, which offer more positive insights in contrast to those promoted by the scientific reductionists or others reflecting a similar materialistic mindset. Alan went on to create gardens in other locations in California and in Virginia. He has left a legacy that continues to shine forth in all of the farms and gardens that have rejected the use of detrimental pesticides and herbicides of the kind that Kenneth Thimann pioneered, farms that are operated with an eye toward long term fertility, toward diversity and respect for all of life, not just the exploitative profit motive. We wish to acknowledge our debt to Alan Chadwick and all that he taught us, taking this opportunity to honor him as he so justly deserves. If you would like to join our efforts and contribute any material you may have about Alan Chadwick, please click on the "Contact Us" button at the top of this page for more information. Thank you.